Cathy Torres speaks to a group of supporters of Rosie’s Law in front of McAllen City Hall. On Valentine’s Day this February, Frontera Fund, an organization that helps cover the cost of abortion care for Rio Grande Valley dwellers, and partner organizations, gathered with local supporters in front of McAllen City Hall to announce “Rosie’s Law” and commemorate the life of the woman for whom the bill is named. Cathy Torres, a campaign manager for Frontera Fund, explained that Rosie’s Law (House Bill 895), sponsored by Rep. Sheryl Cole and authored by Texas-based abortion funds, would “expand Medicaid to include abortion care access.” Medicaid-paid abortion care is currently barred via a legislative provision named the Hyde Amendment. Though Rosie’s Law faces the scrutiny of bitterly anti-abortion state legislators, advocates hope the bill sends the message that anti-abortion laws like the Hyde Amendment, which was passed only three years after abortion was legalized, directly harm already marginalized populations. To understand the profoundness of the passage of the Hyde Amendment, it’s important to examine the other issues in the Rio Grande Valley that affected women and people like Rosie Jimenez at the time, issues that are all linked by their infringement of human rights. 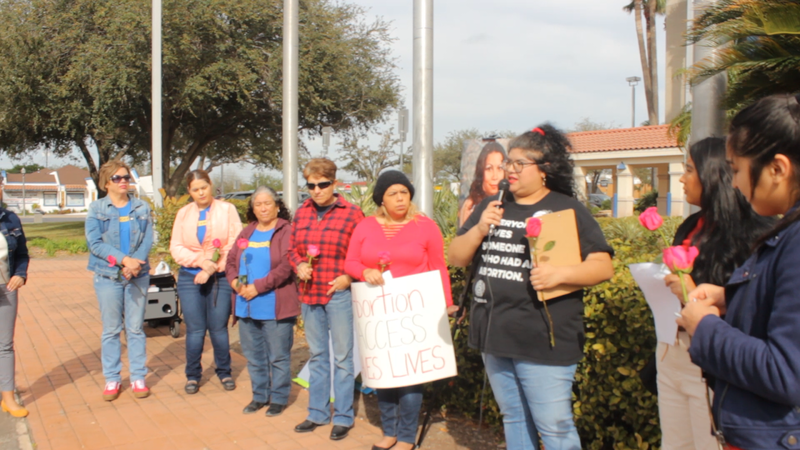 The small group of supporters chose to gather at City Hall because the building used to be McAllen General Hospital, where Jimenez passed from septicemia after she sought an unsafe abortion out of desperation. In an uncanny coincidence, sitting caddy-corner to City Hall today is Whole Woman’s Health, the Rio Grande Valley’s only abortion clinic, its colorful mural clearly visible from where the activists stand around a picture of Rosie Jimenez. Torres tells Jimenez’s story over the microphone. On October 3, 1977, Rosie Jimenez, 27 years old, took her last breath at McAllen General Hospital after battling septicemia for nearly a week. After being turned away from her doctor because she only had Medicaid and no money to pay for an abortion, Jimenez had sought an abortion with a local midwife, who used unsanitary equipment to end her pregnancy, causing the infection that killed her. Jimenez was a mother to her four-year-old daughter and a student of education at Pan American University. 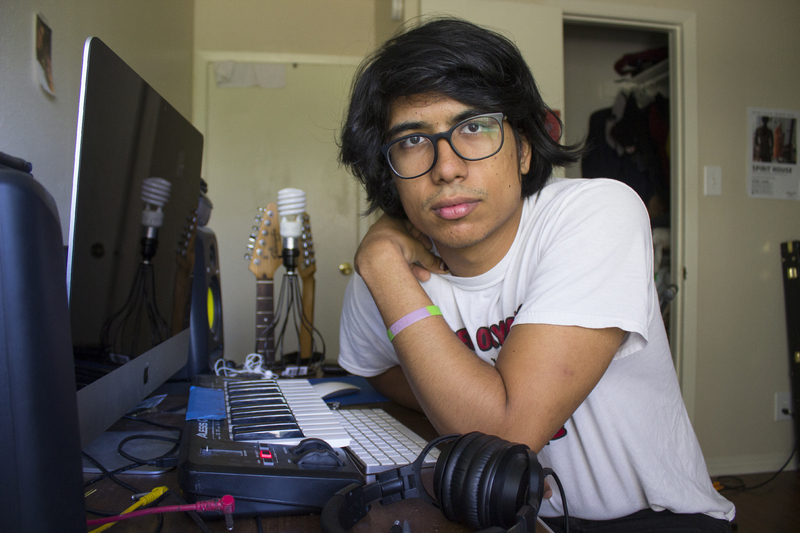 In 2019, RGV pro-choice activists are gathering to tell Jimenez’s story in what is still a politically conservative area that has a very strong anti-abortion stance rooted in religious doctrine. In the late 1970s, McAllen, Texas, though as conservative as ever, was very different than it is today: home to flourishing agriculture and oil industries, a historically segregated town fast-tracking into modernity. In 1976, the same year McAllen’s lavish La Plaza Mall opened, the Hyde Amendment was passed, barring federal funding from covering the cost of abortion care, a rule that most directly affects anyone enrolled in Medicaid. Rosie Jimenez was the first woman reported to have died as a result of Hyde Amendment restrictions on abortion care. 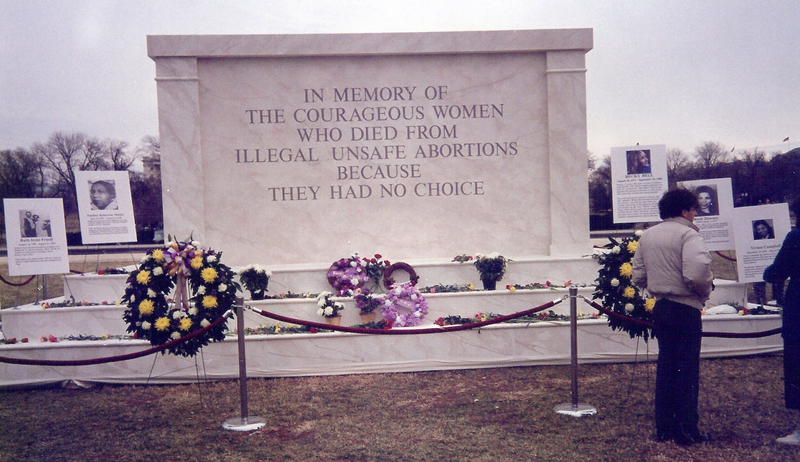 Memorial at a pro-choice rally in Washington, D.C. in 1989. Rosie’s photo is visible on the right. Photo by Carol Moore. During this era, the daily lives of Mexican-Americans, whether migrants or natives to the area, played out in the harsh shadow of the Anglo settlers. In 1971, one town over from McAllen, a white Pharr police officer shot and killed a Mexican-American onlooker during a demonstration against racist police violence. In 1975, two years before he would become McAllen mayor, Othal Brand, who made his fortune exploiting migrant workers, exacerbated ongoing local unrest when he waved his pistol at Texas Farmworker Union activists. Further, when Brand took office in 1977, he was forced to address videotapes showing McAllen police brutalizing Mexican-American men in their custody. However, the Rio Grande Valley event that garnered more attention nationally than in the Rio Grande Valley was Rosie Jimenez’s death. The year she died, and for many years after, Jimenez’s passing sparked protests across the nation, each with up to hundreds of demonstrators in attendance. The organizers of these events seemed to understand the intersection at which Rosie Jimenez existed, in terms of her race and class: she was a poor woman of color, the person most affected by the Hyde Amendment. Now, in the past five years, local activists, with the permission of Rosie Jimenez’s daughter Monique Jimenez, have lifted up Rosie’s story to make it known to their community that anti-abortion laws like the Hyde Amendment have dire consequences for the people of the Rio Grande Valley. According to the pro-choice activists gathered at City Hall, the intersection of identities at which Rosie Jimenez existed is easily understood by black and brown women and people whose daily lives are governed by their social location. They explain that an extension of this recognition is the concept of reproductive justice. Reproductive justice, as defined by Sister Song, is the human right to maintain personal bodily autonomy, have children, not have children, and parent the children we have in safe and sustainable communities. Advocates of reproductive justice argue that atrocities like police brutality and farmworker exploitation are reproductive justice issues, just as much as access to abortion or contraceptives. Rosie Jimenez’s death and the subsequent disruption of her child’s life cannot then be separated from the police violence and worker exploitation that happened simultaneously in 1970s Rio Grande Valley; through the reproductive justice lens, these realities are intertwined because the violence, exploitation, and death are all escalations of infringement of bodily autonomy. Cathy Torres notes that Rosie’s Law is so important because although the pro-choice feminist movement in the United States is credited with legalizing abortion, the reproductive justice movement positions the right to abortion within greater human rights: access to abortion regardless of socioeconomic status is reproductive justice.